Lovely treasures by Sheena Kay. - cocoroxic - Swiss Style Blog. "Happy girls are the prettiest", said Miss Audrey Hepburn once and I completely agree. Today, my order for a custom-made gold necklace has finally arrived and I am so happy to be able to wear the precious little piece coming directly from California, one of the sunniest destinations in USA. My mother called my name as soon as she found a cute package in the mailbox and added that it came from oversea. I immediately knew it had to be my gold necklace from Sheena Kay. I literally ran downstairs to welcome the treasure in my house and lost no single second as I opened it with such a big smile upon my features. My eyes lit up and sparkled. The first thing I had to do was to wear it and to have a little shooting done just for the necklace alone. Yes, that’s how precious such little things can be. And if you think about it, the most precious things in life are all the little things.. Just think about it, how the little things make you smile the most. How little gestures make you feel so appreciated and loved. All those sweet moments and favours put together in one make such a beautiful picture. Like all of us together make such a beautiful community to be in. 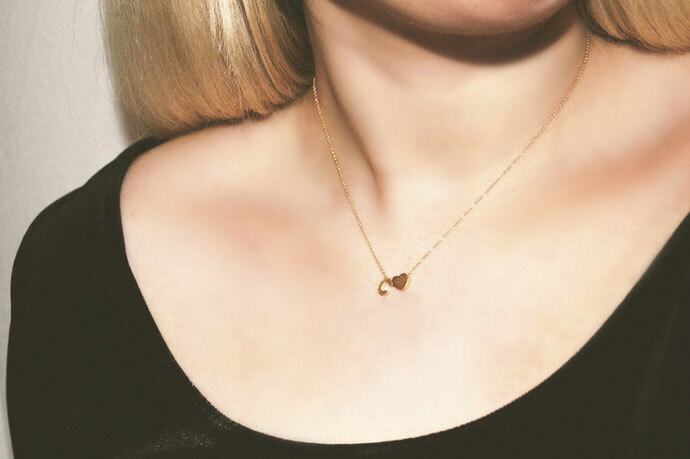 But let’s not go too far now as I would also like to talk about Sheena’s brand a little more..
Jewellery by Sheena Kay is handmade with love by the friendly owner herself and the materials are either: 14k gold filled, rose gold or sterling silver. And you know what the best thing about Sheena Kay Jewellery is? You can literally choose the materials, colours, letters and symbols too. Also, the handmade jewellery is the perfect mini gift for bridesmaids, mother's day gift or just a birthday present for your loved ones. I promise you, they'll love it because it's so sweet and elegant and I am simply in love with it already. And of course I have chosen a 'C' for Cassidy which is my middle name and cocoroxic being my nickname and the very first choice I had when choosing a name for my blog right here. A big thank you goes out to Sheena today, for being such a sweetheart and passionate owner of her own brand. I support everyone who chases their dreams and has the courage to build it up, up and up again. Sheena is an inspiration and I thank her for sharing her sparkling and very sugary dreams and visions with the world. Hello there! I just want to give you a huge thumbs up for the great information you have got here on this post. I am returning to your website for more soon. I know this web page gives quality depending content and additional data, is there any other site which provides these kinds of things in quality? Greetings! This is my first comment here so I just wanted to give a quick shout out and tell you I truly enjoy reading through your posts. Can you suggest any other blogs/websites/forums that go over the same topics? Thank you! Its like you read my mind! You seem to know a lot about this, like you wrote the book in it or something. I think that you can do with a few pics to drive the message home a little bit, but instead of that, this is magnificent blog. A great read. I'll certainly be back.